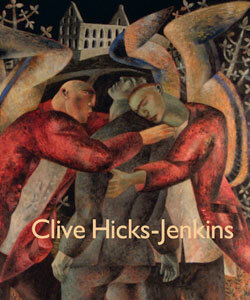 The National Library of Wales in Aberystwyth recently mounted an exhibition of the work of Clive Hicks-Jenkins to mark his sixtieth birthday. Two books were also published during this year, one offering colour plates and critical discussions, the other a collection of poems by six poets with detail from paintings on which they comment. What follows here are some of my own instinctive responses to this art. I referred some time ago to this artist's work by using one of his illustrations to accompany previous blog comments on ‘The Ballad of the Mari Lwyd’ by Vernon Watkins. 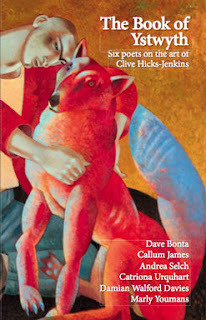 The collection of poems published this year includes a more recent Mari Lwyd poem by Catriona Urquhart. The stark black & white series of conte drawings featuring a looming horse's head attached to, or manipulated by, naked male figures have all the balletic energy of the artist’s previous trade of choreographer. His fascination with this folklore figure is apparent but many of his other paintings also feature animals in some relation to humans and this, for me, emerges as a dominant theme in my response to the paintings. ‘Green George’ re-interprets the dragon-slaying myth, portraying the beast with a set of human-like teeth and eyes directly confronting his killer who rides on a crimson horse returning his gaze, has green-hued flesh and wears a soldier’s steel helmet. Physically near, but as if inhabiting a different plane, a girl sits self-absorbed. 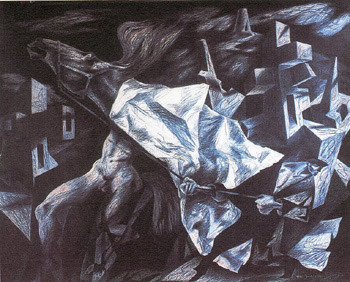 Symbolic items like a maze are placed in the paintings in a style reminiscent of David Jones.